These days there is no excuse for not knowing the answer to trivial questions. The answer is always on the end of a google and we now have google at our fingertips most of the time. However, it is sometimes more fun not to know something. I have no idea what the Elgin Marbles actually are and I prefer it that way. I know that they're in the British Museum, I know that people think that the UK should return them to Greece, but I have absolutely no desire to type the phrase "Elgin Marbles" into a search engine and dispose of my ignorance. This is because what I imagine they might be is more fun. When I was a kid I had one of those furry pencil cases; mine was orange and I didn't use it to keep pencils in. Oh no, I used it for my collection of marbles. I was obsessed with marbles. In retrospect it was a short lived obsession, but it seemed all consuming at the time. It was symptomatic of the wider craze sweeping the school; in the playground in between lessons all you could hear was talk of Oners, Tenners, Chinas, Clears and other nomenclatures which now escape me. 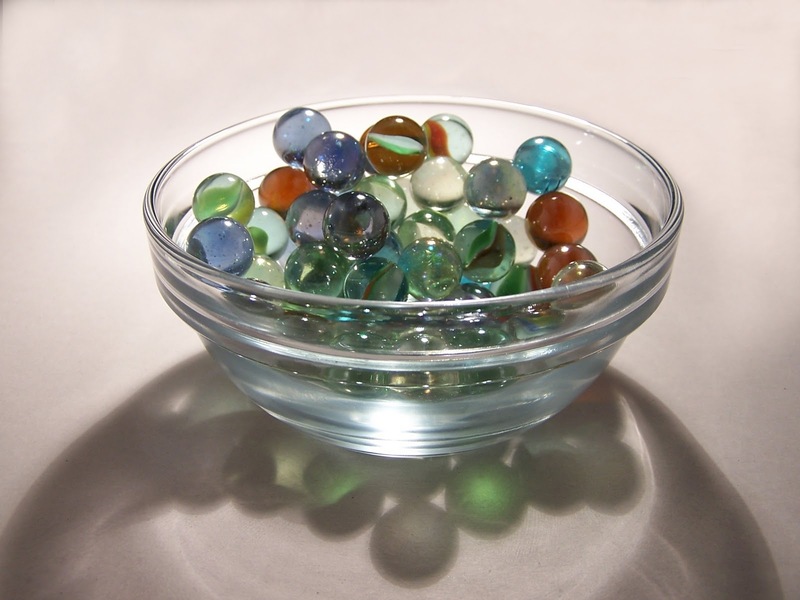 The strange thing was that we rarely seemed to actually play the game of marbles itself. We just collected them, in the same way as we collected other things like miniature plastic heads of the England World Cup Squad (despite a total lack of interest in football), sets of fake coins or Star Wars bubblegum cards. There were even some myths and legends associated with marble collecting. I remember very well the tale of the mythical Tenner Clear. A Clear was a marble that was plain glass; not that exciting in itself. A Tenner was a marble allegedly ten times the size of a normal one. They did exist; in reality they were only three times the diameter of a normal Oner, rather than ten although they would have had nearly ten times the volume. I had never seen a Tenner Clear and in my head it took on marvellous properties, like a crystal ball in which you could see your future, an amulet that would bestow upon the owner the power to collect all the marbles he or she could have ever desired. Whispers started circulating that there was a Tenner Clear under the Prefab. The Prefab was a giant Portakabin which housed the reception classes and had been erected at one end of the playground, probably in the 1950s or 60s. It was raised from ground level on supports underneath which, perhaps unwisely, there was just enough room for a child to crawl. No one ever did of course, we were all too scared. But then the rumours arose. There was a Tenner Clear under the Prefab. It was only visible from the side of the Prefab that faced away from the main school building. We all got down on our bellies and peered beneath, yes, there it was, we were sure of it. Amongst the broken glass, fragments of brick, rusty tins, moss and spiders there was quite plainly something circular and tantalisingly marble-like reflecting the light back at us. It was dark but we were sure of it. Which one of us would be brave enough to crawl under there and claim their prize? Several playtimes came and went, most of which were spent lying flat on the concrete staring at the Tenner Clear. Then one boy braver than most took it upon himself to crawl under there in a bid to make the Tenner Clear his own. I remember watching as he disappeared from the daylight and made his way slowly across to where the treasure was. However, he turned round and started heading back towards the light far too early. When he emerged he said that there was no Tenner Clear - it was just the bottom of a Coke can reflecting the light back at us. He stood up and we all gasped - thick dark red blood was oozing from a wound on his knee. In the darkness he'd crawled over some broken glass. In response to this accident, the school authorities sealed off the underside of the Prefab with stout chicken wire. I was convinced that the Tenner Clear was still under there, now unreachable, even though a first hand report had said it didn't exist. Lying on my stomach in the dust I peered through the chicken wire and persuaded myself that I could still see it. It didn't look like the bottom of a Coke can to me. One day I would come into school with some wire cutters and go under there myself. Perhaps this was what faith in God felt like. Whenever I hear about the Elgin Marbles I imagine they're marbles of this kind. I am completely uninterested in disabusing myself of this fancy. Maybe one of them is a Tenner Clear.